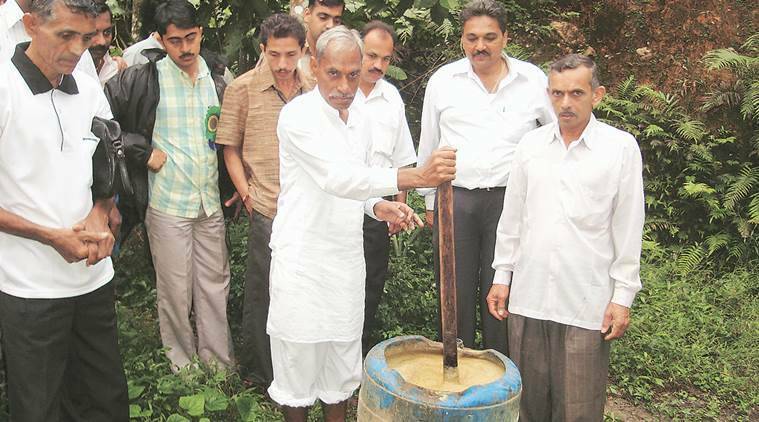 Subhash Palekar demonstrates the preparation of ‘Jiwamrita’ formulation. …..“The farmer needs to apply to the crop a dose of Jiwamrita — a fermented solution containing 200 litres water, 5-10 litres cow urine, 10 kg dung, 1 kg each of gur (jaggery) and besan (gram flour), and a handful of soil from the farm bund — for every acre. The other important thing is to spread a carpet of harvested crop residue between crop rows, which helps to absorb moisture from the atmosphere and also prevents emergence of weeds,” explains Palekar.